Detecting quality defects reliably: compact full container check. 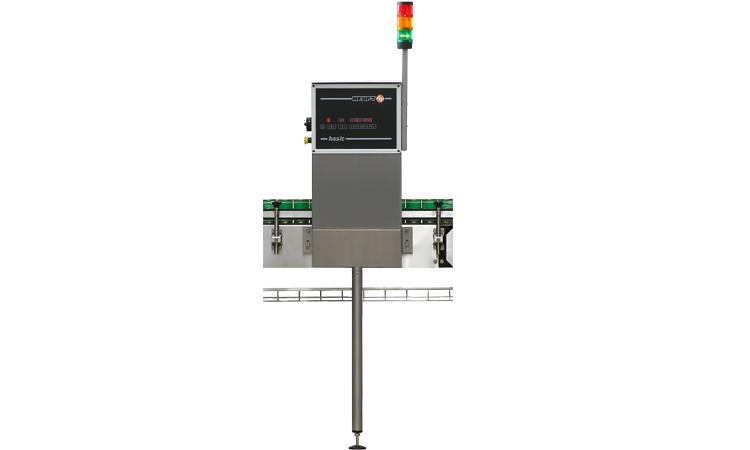 Reasonably priced, compact and versatile: the HEUFT basic is a control system which checks the fill level, the labels and closures of all types of filled containers among other things. Different equipment variants and measuring technologies make the full container check, manufactured in series production, a real all-rounder which can be adapted exactly to on-site requirements. Too little, too much or exactly right: the HEUFT basic can be perfectly equipped with different detection modules for a precise fill level detection. It checks the filling quantity of transparent food jars with infrared technology highly precisely. The high frequency measurement provides exact results for all types of non-metal containers. X-ray technology for determining the exact filling quantity is used in the case of opaque packaging material such as cans of food. Missing, incorrectly positioned and leaking: the HEUFT basic identifies closure faults such as these reliably. Different procedures are used for this: it checks the presence and position with special sensor and optical technologies. Therefore missing closures or closure elements which are too high are noticed immediately. The same applies to deviating closure curvatures which draw conclusions about the internal pressure and consequently the tightness of the containers. Collar, body, neck or wrap-around label: there must not be any missing! The HEUFT basic checks whether this is really the case by means of special sensors which make use of the different reflection characteristics of the container surface and the label. Therefore it is immediately clear when one or several of them are missing. The sensors can be directly integrated in the labeller. A presence check is also possible whilst the containers are being transported on the conveyor as an alternative. Specific, in good time and sustainable: the HEUFT basic prevents faults from becoming serial faults and impairing the productivity of the complete filling and packaging line. For example an integrated locator function records when a particular filler valve regularly underfills in good time. A switch-off pulse is emitted when the number of faulty fillings exceeds a certain, individually adjustable threshold value. Therefore malfunctions can be rectified before they can threaten the safety and quality of complete batches and cause rejection rates which are too high. The HEUFT basic also notices recurring closure and labelling faults in good time and prevents these from going into production and threatening the efficiency and productivity of the whole line by means of a stop signal. Working without any problems: intuitive operation. Cross-language, clear and very easy: it is not difficult to operate the HEUFT basic reliably. All the menus and information are displayed on the clearly arranged multi-segment display as icons independent of the respective language. They can be selected and retrieved at the push of a button without any problems. The user finds his way around quickly. Special access codes protect certain functions and adjustments. This ensures that they are only carried out by authorised users.